Alessandra Sciurba (University of Palermo) and Lucia Gennari (lawyer, ASGI) discuss with Sara De Vido (Ca’ Foscari University of Venice) and Shaul Bassi (HSC Venice) about the genesis and development of the Mediterranea project. 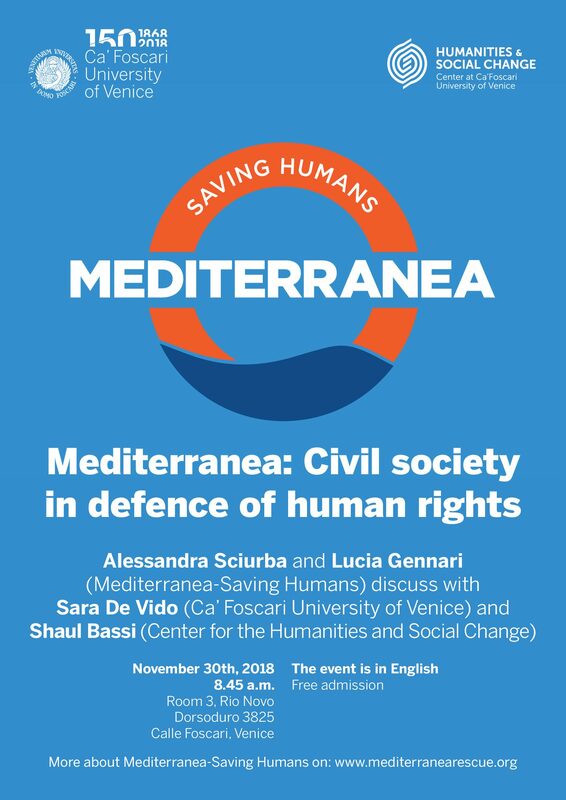 Venice, 30/11/2018 at 8.45 a.m.
Mediterranea-Saving Humans is a project, network, and “Non Governmental Action” created to monitor and report from the central Mediterranean, defying the silence surrounding the migrants’ death toll at sea. Which principles animate Mediterranea? How does it work? What is the legal framework sustaining its action? How was it possible to buy a ship and operate it? The event is in English, hosted by a class of international students. Everybody is welcome.